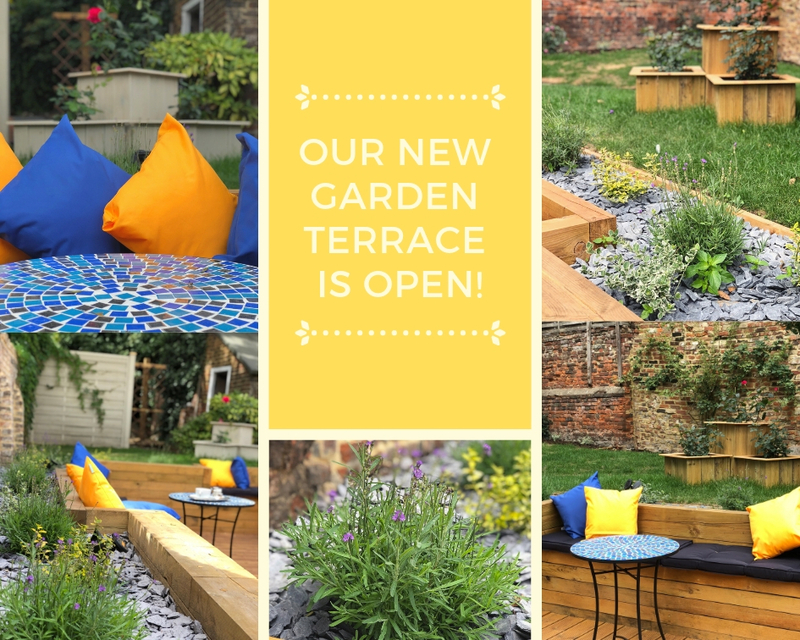 Our beautiful garden terrace is officially open and ready to welcome our clients! At The Chair we strive to make every hair and beauty service a relaxing, indulgent experience and to this end, we have opened a walled garden terrace – beautiful surroundings for our clients to enjoy and relax in during treatments. So whether you’ve arrived a few minutes early, or you’re waiting for colour to set, nestle onto a cushioned hand-crafted bench, surrounded by borders of fragrant herbs and scented roses and take a moment to breathe and enjoy peace and prettiness in the heart of the city. Katie, salon owner, says “It is of upmost importance to me that our clients feel relaxed and rejuvenated when they leave the salon and I hope that this little piece of tranquility in the heart of Canterbury helps achieve this. I deliberately designed the garden to fill the reclaimed wood borders with lavender, rosemary and other herbs known for their delicious scent and relaxation properties, helping to create a full sensory experience within the garden”. For the summer months we have rejuvenated our refreshments offering and invite you to enjoy a sip of something delicious from the complimentary drinks menu, an elderberry cooler or blackberry fizz perhaps? As the summer winds down into Autumn, the Moroccan styled terrace with its mosaic tables and bold coloured cushions is the perfect place to savour the changing season, a warm cup of freshly brewed coffee in hand, on a crisp Autumnal day.